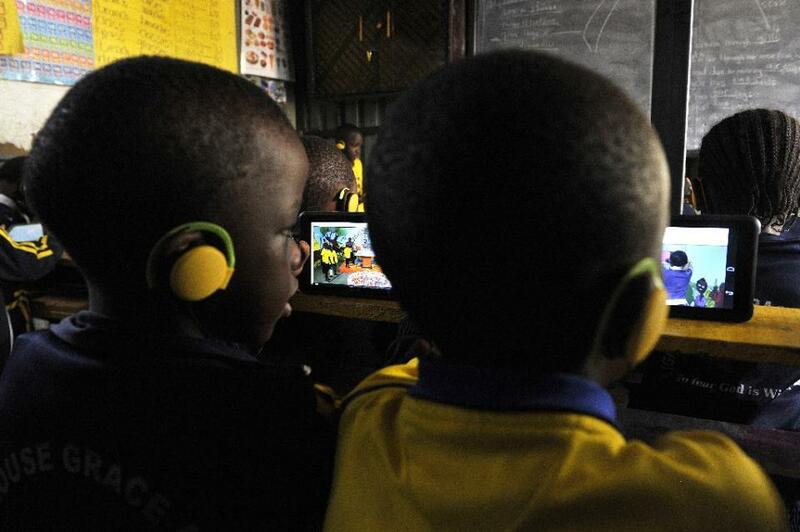 WEB DESK: At the Lighthouse Grace Academy in Nairobi’s downmarket Kwangware suburb, yellow school t-shirts carry the slogan ‘To Fear God is Wisdom’, but in their hands pupils clutch a more worldly path to knowledge: tablet computers. 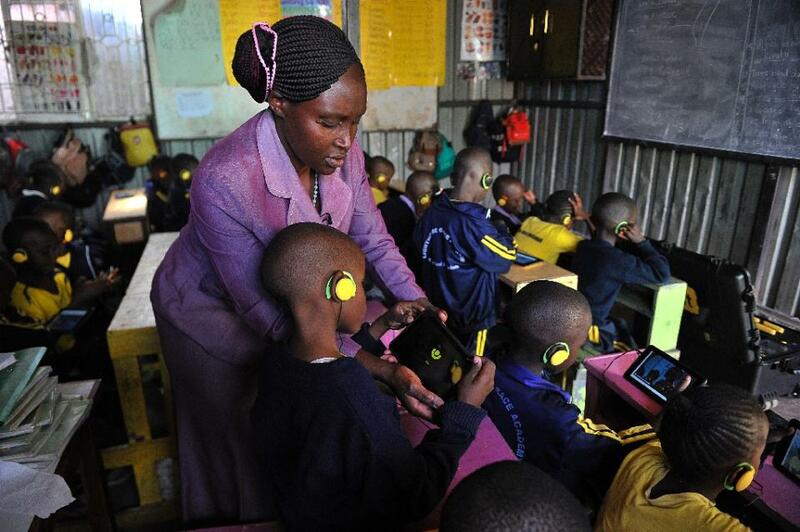 The hand-sized tablets are part of the ‘Kio Kit’, a digital classroom in a suitcase designed by local technology company BRCK, which two years ago launched the hard-wearing, brick-sized modem that works as a wifi hotspot. “The Kio Kit is a way to turn any classroom into a digital classroom,” said Nivi Mukherjee of BRCK Education, the subsidiary that launched the product in September. In her crowded cement-floored, tin-walled classroom with a stopped clock on the wall, seven-year-old Blessing taps away on her new tablet, learning to spell. Unusually for a child in school, she’s smiling. “It’s fun,” she said. Kenya has a thriving tech start-up scene, including the enormously successful M-Pesa mobile money transfer system which allows clients to send cash with their telephones. The tablets and the BRCK are symbiotic: the modem is fixed into a watertight, hardened-plastic wheeled suitcase which has slots for the tablets and acts as a wireless charging station for both. New digital learning materials are uploaded to the BRCK wirelessly during quiet times of the night when more bandwidth is available, and then shared with the tablets during classes. Thieves with an eye on the bright yellow, tough and dust-resistant tablets will be disappointed, as they cannot browse the internet nor be charged independently. 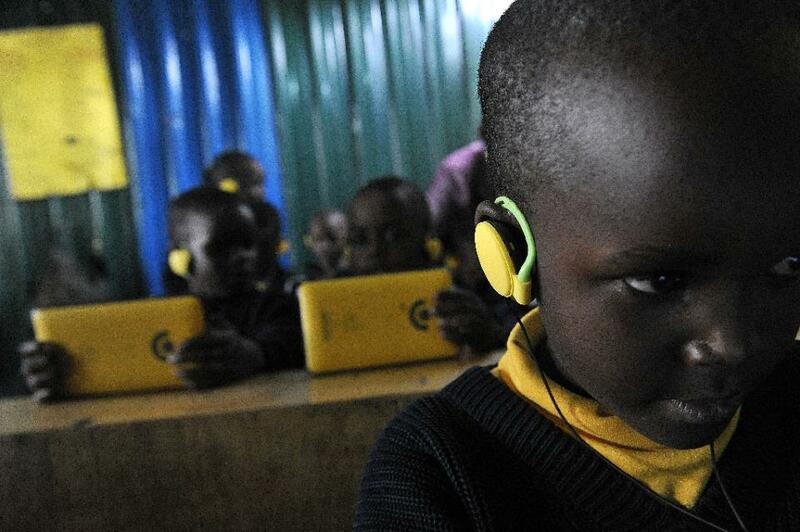 Like the BRCK, the tablets are designed to solve Kenyan problems. “Intermittent power, intermittent internet connectivity, those are just the realities of our infrastructure, so we have to build solutions for those realities, rather than import solutions from other places,” said Mukherjee. At $5,000 (4,500 euros) a piece the price of the kit seems high, given the ambition to provide access to quality education to all in some of the world’s poorest places. But with many schools lacking electricity, let alone facilities to teach computing, Mukherjee says it is not only intended for the private and donor-backed schools in which it is currently being used. “We see this kit being rolled around from one classroom to the next throughout the day, throughout the week, children sharing it, having access to the kind of content and e-textbooks they wouldn’t otherwise have access to,” she said. Just five primary schools and libraries are currently using the Kio Kit, but BRCK Education already has 300 per-orders and Mukherjee hopes to be producing “thousands each month by next year”. In South Africa, the continent’s most advanced country, Gauteng province which houses Johannesburg and Pretoria, started rolling out tablets to 375 high school pupils earlier this year. The plan is to hand out 17,000 tablets to pupils in their final year of high school, and swap teachers’ chalkboards with smart interactive boards targeting especially the poverty-stricken township and rural schools. The tablets come with free data bundle which is active between 5:00am and 9:00 pm while access to social networks is blocked. The scheme was initially hit by theft in the crime-ridden country, forcing authorities to install tracking devices on them, officials said. And authorities came under fire for giving ICT a priority when some schools still lack basics such as flush toilets.